We are a few days into the 2014 World Cup and excitement abounds! The FIFA World Cup, often referred to as the World Cup, is an international association football competition by the senior men’s national teams of the members of Fédération Internationale de Football Association (FIFA), the sport’s global governing body. Fans all over the world tune in and cheer for their teams. This year’s World Cup is being hosted in Brazil, began on June 12th and the finals will conclude on July 13th. Like most knitters we like to knit for any occasion here at Stitch Geek and thought we would round up some patterns that would be great for World Cup knitting/crocheting. First up is the Brazil 2014 World Cup Pet amigurumi. Designer Upa did a wonderful job designing this one, and many others too if you browse her pattern store! 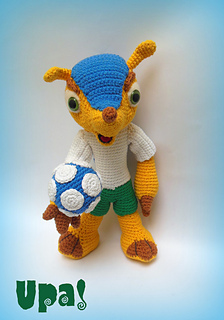 Fuleco – Brazil 2014 World Cup’s Pet pattern by Upa! MiGurrumínAmigurumi technique. Inspired by this year World Cup’s pet: Fuleco. Knit this lovely vest for your small fan to wear while playing ball! Petite Purls – Summer 2009” photos: Daniela Nii ” model: Oliver 2T[4, 6, 8, 10] Shown in size 4. Chest: 21.5[24.5, 26.5, 27.5, 29.5] inches Length: 13[14, 15, 17, 18.5] inches Yarn Bee Snowflake [56% Wool, 22% Polyester, 22% PTT (polytrimethylene terephthalate); 247 yards/226 meters per 4 ounce/113 gram skein]; #05 Limelight (MC); 2 skeins. 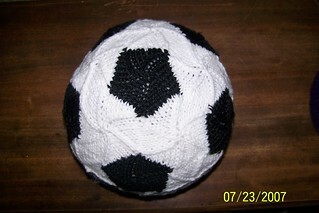 Knit your own football/soccer ball! Knit yourself some bunting in your favorite team colours to show your support! Or if you are not into sports, you can knit these in any colour for showers, parties, decor, etc to pass the time while your loved ones are watching the games. 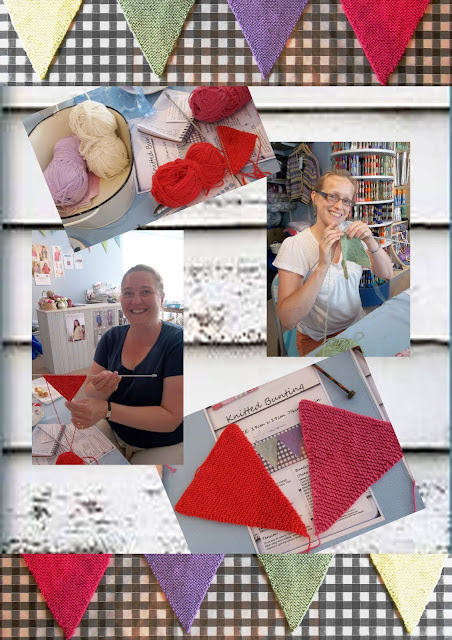 The Design Studio: Free Hand Knitting Pattern for Bunting. Flags.It’s time to bring out the Bunting! This is a very simple knitting pattern for Bunting and the pattern is now available here for free and in my Ravelry store. It’s a perfect pattern for those who are completely new to knitting. Made for fun and a great first knitting project. Knit Your Own World Cup Willie! This is a cute pattern! 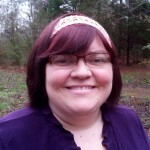 Must click to see, sorry the picture did not show up but you do get the free pattern with this link. Knit Your Own World Cup Willie!We recently accepted a donation to the museum collection that unearthed a secret hobby for some of our social media followers – knitting! As a museum we love to hear from people who have rare or unique items of memorablia that help us paint a picture of fan culture throughout the ages. Which team are you rooting for? Are you knitting/crocheting for your team or someone who is a fan?